Shop for authentic Wisconsin Flags. 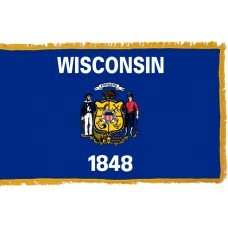 We offer indoor and outdoor Wisconsin flags in durable nylon. Our outdoor flags are finished with a canvas heading, while indoor flags are finished with a lined pole hem and your choice of with or without fringe. 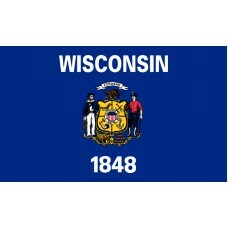 We also offer indoor and outdoor Wisconsin flag sets. The Wisconsin State Flag features a blue filed with the Wisconsin state coat of arms in the center. Above the coat of arms "WISCONSIN" is written and below it "1848" is written. The coat of arms features a shield which has been divided into quarters. The quarters of the shield contain a plow, a pick, and shovel, an arm and hammer and an anchor. On the left-hand side of the shield is a sailor and on the right-hand side stands a miner. Both of them are holding tools. Above the shield, there is a badger and a ribbon with the state motto, "Forward" and below the shield is a cornucopia (a container in the shape of a goat's horn that is filled with fruits and vegetables) and thirteen lead ingots. The center of the shield features the state motto "E PLURIBUS UNUM" which translates as "Out of many, one." The blue color of the flag represents vigilance, perseverance, justice, and loyalty and the white color represents peace, purity, and honesty. The sailor represents the shipbuilding industry of the state and the miner represents the early miners of Wisconsin. The pick and shovel represent the mining industry, the arm and hammer represent the manufacturing industry, the anchor represents the many lakes and waterways that Wisconsin has, and the plow represents the agriculture of the state. The badger is Wisconsin's state animal and represents protection, the thirteen lead ingots represents the mineral wealth of Wisconsin and the Cornucopia represents hope as well as abundance. The Wisconsin State flag was adopted on May 1st, 1981. Wisconsin is a state located in the North-Central region of the United States of America. It shares borders with Minnesota, Iowa, Illinois, Lake Michigan, and Lake Superior. The capital city is called Madison and the largest city is called Milwaukee. Wisconsin was named after the Wisconsin River. Wisconsin is also referred to as "The Badger State" in honor of the early miners who were nicknamed "Badgers" due to the fact that they used to dig holes and live underground. Wisconsin was first inhabited by Native America tribes (11 of which still reside there), which included the Dakota Sioux, Winnebago, Menominee, Ojibwe, Potawatomi, Fox, and Sauk. The first European to arrive to the area was French explorer, Jean Nicolet in 1634. More Europeans began to arrive to the area to trade furs with the natives and in 1667, Frenchman Nicolas Perrot established a trading post at Green Bay and in 1689, the land was claimed for France. In 1754, following the French and Indian war, the British gained control of Wisconsin (as well as all the French land). In 1783, after the American Revolution, Wisconsin became part of the United States of America, even though it was still under the control of the British. It became part of the Northwest Territory which also included Ohio, Illinois, Indiana, and Michigan. Following Britain's defeat in the war of 1812, Wisconsin came under the control of the United States of America and on May 29th, 1848, it officially became the 30th state.